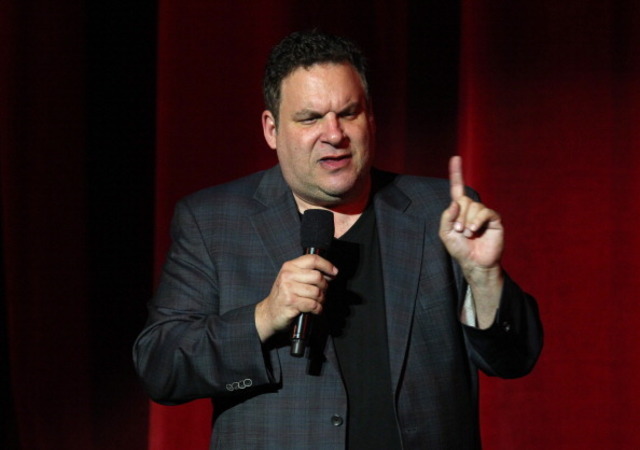 In advance of two new high-profile projects, Jeff Garlin showed again why he may be the biggest mensch in comedy today in an appearance at the 92nd Street Y on July 15. Garlin was hosted by a seemingly unlikely interviewer – liberal firebrand documentary filmmaker Michael Moore. Moore and Garlin have known each other for a long time apparently, although their paths haven’t crossed on any media projects. Their rapport made for a comfortable pairing at the event. The one drawback was that when the pair opened the proceedings up to the audience for questions. These tended to veer erratically between “Curb Your Enthusiasm” inquiries and political remarks, including the recent acquittal of George Zimmerman in the case of the death of Trayvon Martin. Once Garlin got done making fun of Moore’s appearance in shorts and sneakers in an opening salvo, Moore did bring some interesting insights out of him. Garlin brought a clip from his new movie “Dealin' With Idiots,” which he wrote, directed and acted in, with an ensemble cast including J.B. Smoove, Bob Odenkirk, Steve Agee, Fred Willard, Kerri Kenney and Nia Vardalos. Garlin also will be leading the cast of his other big project, an ABC TV series, “The Goldbergs,” set to debut this fall. Although there’s nothing definite from Larry David about another “Curb” season, Garlin said, he only agreed to take part in “The Goldbergs” on the condition that it would accommodate shooting more “Curb” episodes if and when that happens. This gave the event a bit of entertainment news value, but the real focus of the dialogue was the life lessons and insights Garlin shared. These covered today’s flood of media – Garlin emphasized that watching movies on a smartphone is not a good experience – as well as politics and comedy. Garlin said he doesn’t bring politics into his stand-up, because he can only be angry about it and can’t be funny about political topics. When asked about the new comeback campaigns being waged by Eliot Spitzer and Anthony Weiner, Garlin first dismissed the question by saying he doesn’t live in New York and therefore didn’t care either way – but then did get passionate about the need for greater integrity from political figures. Although Garlin’s views on issues, expressed on stage as certain topics came up, probably were more in line with Democrats or liberals, he said that when he’s performed for political parties’ functions, the Republicans have been better audience – being looser, more receptive and laughing more. Democrats, in Garlin’s observation, tend to get uptight about what’s alright to laugh at. Most importantly, near the end of the 90-minute program, Garlin gave his biggest insight about the arts and entertainment business. Asked by an audience member why he dropped out of college to pursue stand-up comedy, Garlin said if you’re trying to make it in the arts and you give yourself something to fall back on, you inevitably will fall back on that. He had to give himself no choice but to persevere. Garlin added that this doesn’t mean you’re not scared, but you push through that fear.